When I spoke earlier today to Peter Thompson about the sale of Asteria, he also mentioned that he and Michael White have taken over the central listing of the 49.9m motor yacht Cuor di Leone. This superyacht was built by Benetti in 1999 as the fourth in their Golden Bay series and was designed to be able to undertake long cruises and charters in the Mediterranean, Caribbean and other exotic areas of the world. Lloyds classed and MCA compliant, her Stefano Natucci interior has accommodation for up to 14 guests in six staterooms including a full beam master suite on the main deck. On the lower deck are four further staterooms (two doubles and two twins) with ensuite bathrooms. Further to this there is a day room on the upper deck that can be converted into a guest room (either double or twin) with bathroom facilities. 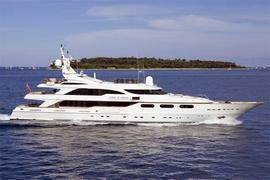 Peter says she's just emerged from a $4 million major refit and Cuor di Leone offers the buyer an ideal yacht for private or charter use, asking $19.995 million.